Yesterday, Omnitrans unveiled its New Flyer Xcelsior buses, and the public response was overwhelmingly enthusiastic. These new buses are expected to go into service sometime next week, East Valley routes only. Below is a detailed list of some of the features included in the New Flyers. It’s a great time to climb aboard Omnitrans! These 40-feet long buses have a passenger capacity of 40 seated and two wheelchair positions. Bike racks have been expanded to accommodate up to 3 bicycles. Stop request sign is centrally located for easier viewing. Interior noise has been reduced to 72 decibels. Special heat guard glass blocks 95% of UV rays. Climate control system provides improved cooling and heating for both passengers and drivers. Mobility device loading ramp ratio improved for easier boarding and more precise curb alignment. Conversion from analog to digital instrumentation improves visual driver operations. Tinted sunroof allows more light in the back of the bus. Non-skid flooring helps protect against slips and falls. Contactless Acoustic Sound System (CLASS) detects people and objects near exit doors with enhanced ultrasonic transducers. Four-wheel disc brake system provides smoother braking with greater efficiency, and potentially saves $13,000 in maintenance costs over the life of the coach. Fiberglass exterior panel construction is more dent resistant than aluminum construction. 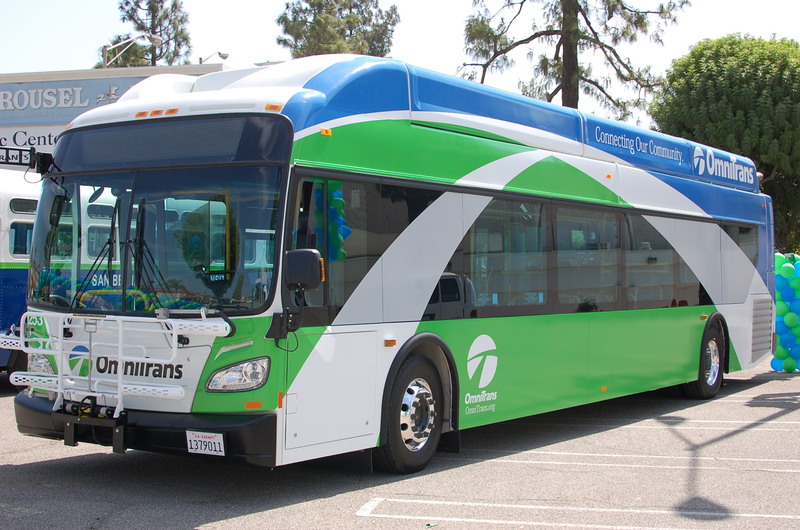 This entry was posted in Events, Uncategorized and tagged new flyer excelsior features, new flyer xcelsior bus, omnitrans new buses, Omnitrans rebranding. Bookmark the permalink. this wiil be a cool bus for omnitrans!